Please be patient with me as despite being a long time player, I am not much of a gear buff. After being convinced by its versatility, affordability and portability (so many 'ities), I acquired a new TH30 earlier this year as a replacement to my venerable and beloved, yet often broken and maligned JCM2000 head. I wasn't able to afford a 'proper' Orange like the Rockerverb and so the TH30 seemed like a decent alternative. It sounded (and looked) absolutely fantastic when I tried it in my local music shop and I particularly liked the ability to limit its output for home use as well as its smaller form factor. The cleans were adequate and although not exactly 'vintage', the crunch tone was very usable for bluesy applications as well as hard-rock and metal. It's simply not loud enough for me. I went in to this with my eyes open given I was downgrading from a 100w to a 30w head (probably mumbling something to myself about inverse square laws) but I simply was not prepared for the reduction in output. When mated to my 4x12 Marshall cab, my bandmates' ancient Line6 Spider IV 75 that he uses at rehearsals is easily MUCH louder than the TH30. I have to frequently ask him to turn down in order to be heard even though he is on half volume and I am near on full. I wasn't able to fully crank the amp before I bought but it sounded brutally loud at the time. There doesn't seem to be anything wrong with it as far as I can tell as it has never been any different since when I bought it. The other issue is how incredibly muddy and indistinct the treble sounds are with any level of gain. I used a Marshall JVM a few weeks ago and it made me sad at how clearly I could pick out individual notes when compared to the TH30. I have tried putting an MXR EQ pedal in the FX loop, before the amp as well as messing around with the shape knob. Nothing ever improves the situation. I often like to play with a fuzz pedal in front of my amp and believe me, this just makes matters even worse (when I was able to get very nice results with other amps). I was pondering whether to buy a new set of valves, but I am unconvinced it will remedy my issues. My question to you is this; does this sound normal to you or is there a problem with the amp? Should I try replacing the valves or should I cut my losses and buy another amp? Last edited by MemoryLoss on Tue Nov 06, 2018 10:30 pm, edited 1 time in total. I Owned the TH30 and rockerverb MKII at the same time and it didn't take me long to sell the TH30. I tried new tubes and different pedals. It just wasn't the amp for me at all. I did not like the tone, I'm sure it's great for certain types of players and music but It definitely wasn't for me. The rockerverb MKII is so much better in every way in my opinion. I've always had England built oranges but really wanted to try the TH30, the price and features seemed attractive but The tone just wasn't there for me. 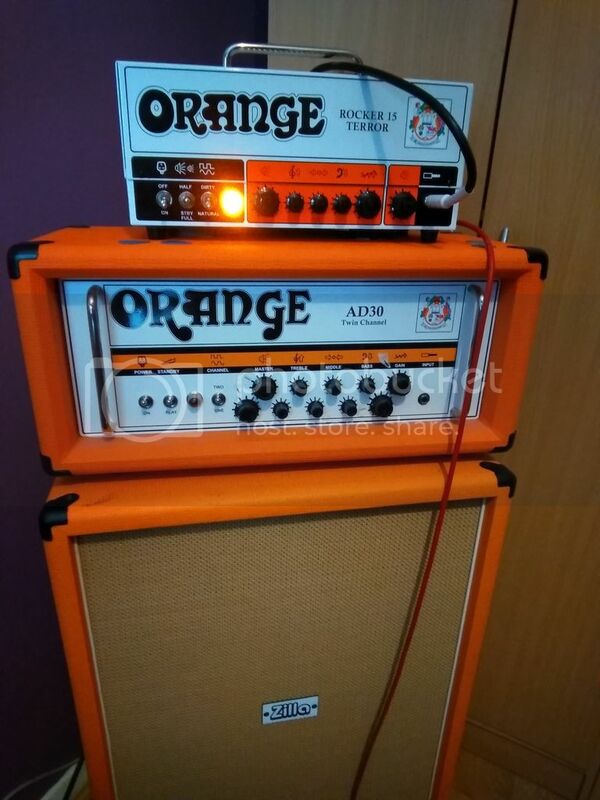 Also on a side note, and maybe my TH30 was really early or something but when I set it next to my other orange amps, the orange paint on the Face plate wasn't even the same color orange, which i thought was weird. I'm not saying all the orange china gear is junk or anything but There better amps are definitely built in england. This sound a bit strange... OK I've never used the TH30 ...but have used other Orange 30 watters, regularly gig with the AD30 and have many times with a Rocker 30 both plenty loud enough. Admittedly it's not the most popular amp on this forum but can't recall any one else having an issue with volume or muddyness. However if it's only new this year the valves should not of had that much use....was it always like this? I agree with Ronnie, The TH30 is Plenty Loud! You may have a tube/valve issue going on or something. I would swap them out just to make sure or test them if you can. I traded my TH30 for an RV50 mk. III and I have no regrets. The TH30 is a pretty bright amp, so I'm totally at a loss. I've only had mine on 30 watts a couple of times because 15 watts usually covers about anything. You've obviously got something going on, even if it's just missing your old amp. Thanks for the awesome replies, guys. I do think I need to upgrade the amp as the RV50/100s look very tempting. I already checked with the store I bought it from and they offered a somewhat insulting part-ex price for the TH30. I expected as much!! If I did want to swap out the valves, does anyone have any recommendations? Are there other mods you'd recommend to the amp to get less fizz, more volume and more definition in the tone? Oh and the volume and definition issues have been the same since I bought it. I would buy some valves first and see what difference that makes, Ehx, JJ, Tungsol are popular. Worst case, you still change to another orange amp those pre amp valves can be used in the new orange amp when required. Any mods will lower the resale value. Not necessarily. I upgraded both transformers in mine and sold it for the more than I bought it new. Just have to find people that understand the mods you've done (or don't understand at all). Hi, I just thought I would add my pennyworth. I have the TH30 combo (for nearly 3 years now) and recently performed a back to back with several amps including the Rockerverb 50 MK III Head. I have always found I can get a very articulate tone, not muddy, with all my guitars, with most amounts of gain, perhaps a little dark with LP's but only with the 57 pups. With Burstbuckers and 490R/498T it's fine. Tele is superb. I only really use a classic crunch or clean tone most of the time, but we do go heavy gain on a couple of numbers. As for volume; well I didn't think there was a lot in it compared to the Rockerverb when maxed out to be honest and the clean channel of the TH30 is sublime I think and VERY loud, just not Fender'ish. Other amps that we compared were a Marshall DSl 40CR Combo (I think that's the newer one) and Origin 50 head and it matched those for volume easily. Also had the Dual Terror and CR120. Speakers were all Orange PPC112 where we could (V30), although the DSL was just it's on board speaker. I think there may be something wrong with your TH30. All tubes were original stock tubes, no one had tube rolled at all. Hope this helps a bit. tubes (after 3 years), that could be what you are hearing. Perhaps time for some new power tubes? No, I meant something wrong with memoryloss TH30. I am saying that mine is loud and not muddy (as per MemoryLoss oginal post). Aaargh! Light dawns over Marblehead! That's not the one on the coast of Massachusetts USA, either.